Where’s a physical spell checker – otherwise known as a dictionary, which nobody carries any more – when you need one? 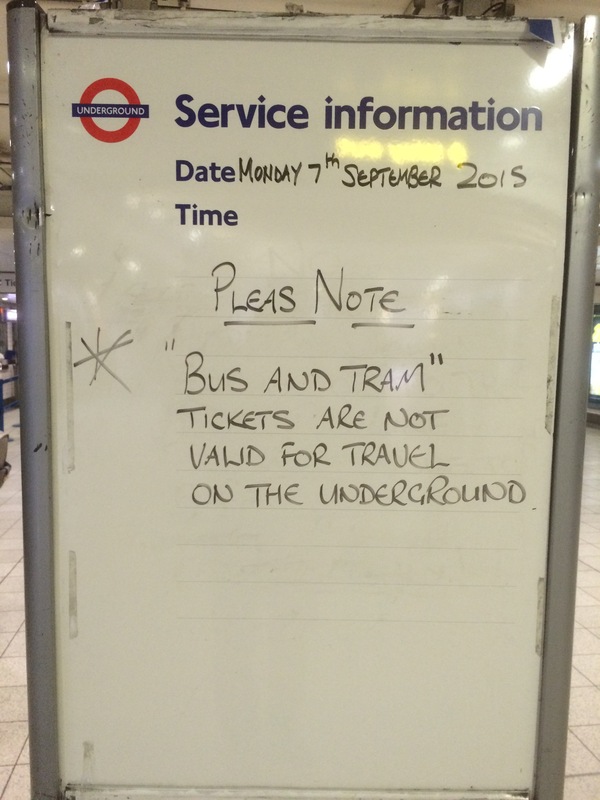 I remember about 20-some years ago in the US I saw a ticket tout with a sign saying ‘I wont (sic) tickets’. Here’s a picture of a slightly more recent gaffe. Online spell-checking tools in our email and document creation applications make it easy for us to avoid elementary blunders. They’re like calculators though, they make us lazy with our command of the basic skills of literacy and numeracy. It’s OK to make these mistakes verbally, because it’s a different language to the written form and no-one can read what you say. Not so when your output is codified for all to see. We can’t always rely on our friends to put us right on our mistakes. We have to do the work ourselves, or risk being found out. There’s something very comforting about proverbs. They’re rather like a comfy armchair to me, in the way a spreadsheet is to an accountant. They are the shorthand of our language, as well as a useful guidance to living life by the numbers. “A stitch in time saves nine.” “If a job’s worth doing, it’s worth doing well.” These phrases have been honed and shaped over time, a little nub of the collective experiences of humankind over the centuries. They can serve you well in business too, as long as you understand them for what they are. One of my favourite business proverbs is “A rising tide lifts all boats.” It encapsulates the notion that everybody benefits from an improvement across the board. As our beloved written and spoken languages evolve and become – dare I say it – a little more relaxed, we don’t seem to mind committing the formerly heinous crime of ending a sentence with a preposition. Back in the day – which itself is an odd idiomatic phrase – people used to get pretty worked up about grammar and syntax. They say that language neither progresses nor decays, it simply changes. Whatever it does, I think it serves us all better to be more flexible and less rigid. A great example of this is in poetry and songs, where ending a line with a preposition can help the writer out and make the line scan more elegantly. Who could forget the famous double preposition of Wings’ Live and Let Die: “…this world in which we live in…”? More recently, but already a classic, is the Jay Z and Alicia Keys song Empire State of Mind with its line “concrete jungle where dreams are made of”. Prepositions are handy little nodes connecting elements of a sentence together, so let’s continue to allow them to roam free, for which our language will be the better :-). One of the several things that I really like about where I live is that people say hello to you in the street. People you don’t know. Strangers. I live in a small town – it would be considered a village in my native country – in the west of Ireland. It’s quite normal to say hello, smile, nod or exchange a view on the weather with people you don’t know a few times during a walk through the town. I really like it. People are familiar with the friendly welcome of the Irish – cead mile failte, or a hundred thousand welcomes and all that – but I suspect you get this level of friendliness in all small places. You don’t get this in a big city, at least in not a single one I’ve ever been to, and I’ve probably only been to a couple hundred in my life. People don’t make eye contact, their body language is self-protecting, they avoid making any kind of acknowledgement of your presence. Maybe this is because it feels like everything is transient, unsafe, or unfamiliar in a seething population, but to me it’s a pity. We’re social animals after all, and interaction with fellow humans improves our mood, most of the time. Give me the kindness of strangers in small places any time. The latest argument with Mrs D – or, as I like to call it, a robust discussion – reminded me of how important it is in both our personal and business lives to communicate well. Have you ever been in a group dynamic (dinner party, dialogue for 2, meeting) and noticed how often people interrupt each other? How often somebody asks a question and the next person chooses not to answer it, and asks their own question or makes a statement pushing their own view or agenda? Annoying, isn’t it? I’m no saint, and it’s something I have to work on all the time, but I try to respect the other person and wait til they’ve finished talking, and then either answer their question or further the topic in some way. It’s about respecting the person and what they have to say, and contributing something that gets you both nearer to where you need to be. It’s basic marketing isn’t it? Listen-absorb-consider-contribute. Swiss linguist Ferdinand de Saussure was a clever bloke. He distinguished between 2 languages: langue, the language, and parole, the spoken language. We speak one, and we read and write the other. They can be quite different. So it seems a bit odd to me that we write to be read, rather than to be heard, especially in the stripped down, dumbed down, sound-bite-driven world that we inhabit these days. The blog seems to me to be a classic example of this. You can certainly get quicker through those posts that are written closer to the language of conversation.